Protected areas are being established without acknowledging the customary rights of local communities. : Sarobidy Rakotonarivo Until the 1980s, biodiversity conservation in the tropics focused on the “fines and fences” approach: creating protected areas from which local people were forcibly excluded. More recently, conservationists have embraced the notion of “win-win”: a dream world where people and nature thrive side by side. To this day, protected areas are being established coercively. They exclude local communities without acknowledging their customary rights. Sadly, most conservation approaches are characterised by a model of “let’s conserve first, and then compensate later if we can find the funding”. A new conservation model, Reducing Emissions from Deforestation and forest Degradation (REDD+) is an example of this. Finalised at the Paris climate conference in 2015, it seemed to offer something for everyone: supplying global ecosystem services – such as capturing and storing carbon dioxide and biodiversity conservation – while improving the lives of local communities. Unfortunately, REDD+ is often built on protected area regimes that exclude local people. For example in Kenya, REDD+ led to the forceful eviction of forest dependent people and exacerbated inequality in access to land. The approach is underpinned by laws (often a legacy of the colonial era) that fail to recognise local people’s traditional claims to the forest. In doing so, REDD+ fails to provide compensation to the people it most affects and risks perpetuating the illusion of win-win solutions in conservation. 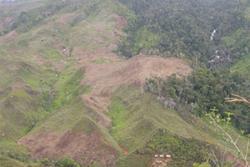 REDD+ is just one way in which forest conservation can disadvantage local people. 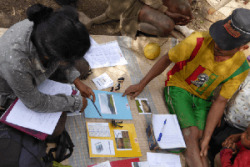 In our research we set out to estimate the costs that local people will incur as a result of a REDD+ pilot project in Eastern Madagascar: the Corridor Ankeniheny-Zahamena. Our aim was to see whether we could robustly estimate these costs in advance, so that adequate compensation could be provided using the funds generated by REDD+. Our research found that costs were very significant, but also hard to estimate in advance. Instead, we suggest that a more appropriate approach might be to recognise local people’s customary tenure. Madagascar, considered one of the top global biodiversity hotspots, recently tripled the island’s protected area network from 1.7 million hectares to 6 million hectares. This covers 10% of the country’s total land area. Swidden agriculture in the eastern rainforests of Madagascar. : Sarobidy RakotonarivoAlthough the state has claimed ownership of these lands since colonial times, they are often the customary lands of local communities whose livelihoods are deeply entwined with forest use. The clearance of forests for cultivation has traditionally provided access to fertile soils for millions of small farmers in the tropics. Conservation restrictions obviously affect them negatively. Conservationists need to assess the costs of conservation before they start. This could help to design adequate compensation schemes and alternative policy options. We set out to estimate the local welfare costs of conservation in the eastern rainforests of Madagascar using innovative multi-disciplinary methods which included qualitative as well as quantitative data. We asked local people to trade off access to forests for swidden agriculture (land cleared for cultivation by slashing and burning vegetation) with compensation schemes such as cash payments or support for improved rice farming. We selected households that differed in their past experience of forest protection from two sites in the eastern rainforests of Madagascar. We found that households have different views about the social costs of conservation. 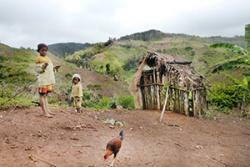 Choice experiment surveys with local households in Madagascar. : Sarobidy RakotonarivoWhen households had more experience of conservation restrictions, neither large cash payments nor support for improved rice farming were seen as enough compensation. Less experienced households, on the other hand, had strong aspirations to secure forest tenure. Competition for new forest lands is becoming increasingly fierce and government protection, despite undermining traditional tenure systems, is weakly enforced. They therefore believed that legal forest tenure is better since it would enable them to establish claims over forest lands. Unfortunately, knowing what would constitute “fair” compensation is extremely complex. Firstly, local people have very different appraisals of the social costs of conservation. That makes it difficult to estimate accurately the potential negative costs of an intervention. It’s also hard to evaluate how cash or agricultural projects will stimulate development. This makes it challenging to estimate how much, or what type of compensation should be given. These challenges are compounded by the high transaction costs of identifying those eligible as well as the lack of political power of communities to demand compensations. Conservation approaches, particularly fair compensation for restrictions that are imposed coercively, need a major rethink. One solution could be to formally recognise local people’s claims to the forest and then negotiate renewable conservation agreements with them. This is an approach already used successfully in many Western countries. In the US for example, conservation organisations negotiate “easements” with landowners, to protect wildlife. Agreements like this ensure that local people’s participation is genuinely voluntary and that compensation payments are sufficient. Our research shows that there’s a strong demand from local people for securing local forest tenure. There’s also evidence that doing so may better protect forest resources because without customary tenure local people are more likely to clear forests faster than they would do if they were given secure rights. We therefore argue that securing local tenure may be an essential part of social safeguards for conservation models like REDD+. It could also have the added benefit of helping to reduce poverty. The social costs of forest conservation have been generally under-appreciated and advocacy for nature conservation reveals a lack of awareness of the high price that local people have to pay. As local forest dwellers have the greatest impact on resources and also the most to lose from non-sustainable uses of these resources, a radical change in current practices is needed.